Lead author Jennifer Hughes from the Whitehead Institute, USA, said: "Genes that have survived on the Y chromosome are extraordinarily long-lived and likely serve important biological functions. However, there are numerous exceptions where seemingly critical genes have been lost from the Y chromosome in certain mammals. In many cases, these genes were not actually eliminated but have found new homes in the genome. "Now we've revealed four genes that have been lost from the Y chromosome and rescued by moving to other chromosomes. For the first time, we show that this has occurred in humans, as well as in a diverse range of other mammals. These relocated genes have hung around the genome because they are indispensable for normal development." 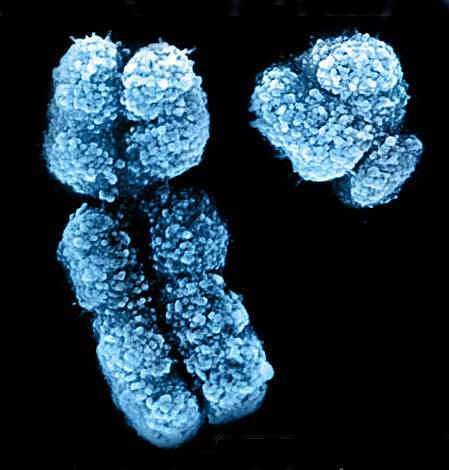 This suggests that, following the loss of the gene from the human Y chromosome, the X chromosome 'backed up' a copy of its EIF2S3 gene onto an autosome, indicating the importance of this gene. In humans, the autosomal copy of the gene showed increased activity in the testis compared to other tissues, suggesting an essential role in sperm production, and a possible genetic factor in male infertility. "The Y chromosome is dramatically smaller than the X chromosome and has already lost nearly all of the 640 genes it once shared with the X chromosome." More insane assertion I have not read recently. I am sure that the author has no idea at all for microbiology. There is no organism on this planet that have redundant genes unnecessary organs or systems. They have complete functionality, which makes them perfectly arranged for their living environment. Everything is in place and if they lose genes the species would not survived. First the Creator created man and then from its genetic information created woman. And modern biology confirms this fact. First the Creator created man and then from its genetic information created woman. And modern biology confirms this fact.